List of sponsors in Mario Kart: Double Dash!! A Beauty Maniac sign from Mario Kart Wii. Beauty Maniac is a sponsor that appears in Mario Kart Wii and Mario Kart 7. In Mario Kart Wii, the shop appears to be a clothing store that primarily sells various tops, but in the Mario Kart 7 version it appears to instead sell books, shirts and trousers. The original logo consists of the company name in an all capitals teal font with a paler and then darker outline within a pale oval. The oval has a white, pale and then white outline before leading into a darker background. The updated logo uses a similar composition and the same oval and background, but instead uses a rounded teal gradient font with a white outline. It is advertised by means of shops. A Beauty Maniac sign from Mario Kart 7. A Big Fire!!! trackside banner from Mario Kart Wii. Big Fire!!! is a sponsor that appears in Mario Kart: Double Dash!! and Mario Kart Wii. It is ambiguous as to what the company does, but it appears to have some sort of relation to Bob-ombs. The logo consists of the company name in an angled, all capital black font, with the name reflected in a deep orange one above it. There is a black star between the two words, with a monochrome red and white Bob-omb Buddy with a star on its fuse stood on top of it. The entire logo appears on an orange background with a curved paler orange border. It is advertised by means of trackside banners. A Big Fire!!! trackside banner from Mario Kart: Double Dash!!. Boomerang Bros. International Airlines (often abbreviated to BBIA) is an airline that appears as a sponsor in Mario Kart 8 and Mario Kart 8 Deluxe, and makes a cameo appearance in Super Mario Odyssey. It runs flights to some of the courses from the game, so presumably transports the racers to these locations for the races. It appears to be run by Boomerang Bros. The logo consists of the name or initials in a navy blue sans-serif font, with the first "I" in "International" being replaced with a red-striped blue Boomerang. A different logo has the abbreviation "BBIA" on the left with a red shape on the left hand side, while another different logo is simply the abbreviation on a gray background. It is advertised by means of posters, patches and trackside banners, appears on planes and departures boards, and is referenced on a map. The announcer on the intercom in Sunshine Airport mentions a flight provided by Boomerang Bros. International Airlines, "This is the final boarding call for Boomerang Bros. International Airlines, Flight 117a to Sweet Sweet Canyon, departing from Gate 3", however this is inconsistent with the departures boards around the airport, which list the same flight as being number 4300. The Boomerang Bros. International Airlines flights from the Sunshine Airport departures board. A Boomerang Bros. International Airlines trackside banner. 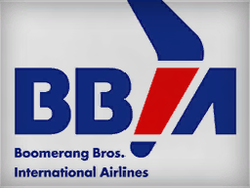 A Boomerang Bros. International Airlines logo. The Bowser Oil logo from Mario Kart 8. Bowser Oil is a sponsor that appears in Mario Kart 8 and Mario Kart 8 Deluxe and makes a cameo in Super Mario Odyssey that presumably supplies oil for the Karts, Bikes and ATVs used in the game, run by Bowser. The logo of the company is the name written in a simple, black font, with the center of the "O" in "Oil" being replaced with a Bowser symbol. It appears on a yellow background, occasionally with a black and white checkered line underneath. A variant of this logo inverts the colors, with another one placing the word "Bowser" above the word "Oil". It is advertised by means of trackside banners, signs, flags and promotional tents, and is also referenced on a map and is the main sponsor on the black, purple and yellow varnish of the Circuit Special. A Bowser Oil trackside banner from Mario Kart 8. The top of a Bowser Oil promotional tent from Mario Kart 8. A Bowser Oil sign from Mario Kart 8. A Bowser Oil logo from Mario Kart 8. A Bowser Oil patch from Super Mario Odyssey. A Bullet Bill Speed Trial poster from Mario Kart 8. Bullet Bill Speed Trial is a sponsor that appears in Mario Kart 8 and Mario Kart 8 Deluxe, which makes a cameo appearance in Super Mario Odyssey and some of the promotional material for Nintendo's collaboration with Kansai International Airport. The company presumably either runs or times the Time Trials that can be played in the games, and has some relation to Bullet Bills. The logo of the company consists of the company's name written in a simple slanted beige-colored font on a red background, below a simplified image of a Bullet Bill on a navy blue background, in the same beige color. These rectangles are separated by a beige line. However, on the trackside banner variant, all of the writing and imagery appears in the blue rectangle, with just a thin red one underneath. The sticker variant retains the design from the trackside banners, but without the beige dividing line, and a smaller red line at the bottom. There are another two logo variants which appear on the Sport Bike's blue varnish, one which has "Bullet Bill" on the top and "Speed Trial" below in yellow, slanting to the let with another yellow line above it and a blue background. The other one is closer in design to the trackside banner variant, but now has yellow lines and writing, and removes the Bullet Bill and red strip beneath it. It is advertised by means of trackside banners, signs, cans, stickers, posters, patches, appears on a varnish and is also referenced on a map. A Bullet Bill Speed Trial trackside banner from Mario Kart 8. 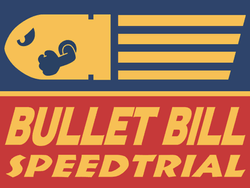 A Bullet Bill Speed Trial logo from Mario Kart 8. The Mario and Toad artwork from the Nintendo and Kansai International Airport collaboration. A Bullet Bill Speed Trial patch from Super Mario Odyssey. A Burning DK trackside banner from Mario Kart 8. Burning DK (also called Burning DK Sports Drink) is a sports drink that appears as a sponsor in Mario Kart 8 and Mario Kart 8 Deluxe, and makes a cameo appearance in Super Smash Bros. for Wii U and Super Smash Bros. Ultimate. The drink appears to be endorsed by Donkey Kong, or the company that produces it run by him. The company's logo features an edited version of his 2D artwork to show him holding the drink in orange, red and white on a yellow background with orange flames and bubbles. The name itself is written in a black serif font, though appears red on the cans. A different logo variant simply features the company name in red on a white background. It is advertised by means of posters, trackside banners, cans, signs and is also referenced on a map. A Coco Burger sign from Mario Kart Wii. Coco Burger is a sponsor that appears in Mario Kart Wii and Mario Kart 7. The sponsor appears to be a fast food burger restaurant chain which mainly sells burgers and juice. According to the Menu, it sells Mushroom Burgers and Juice, Flower Burgers and Juice, Star Burgers and Juice, Banana Burgers and Juice and Green Mushroom Burgers and Juice. In Mario Kart Wii, images of all five items appear on the menu, however instead of an updated image of a Banana a Mario Kart: Double Dash!! artwork is used instead, and in Mario Kart 7, despite all of the burgers and juices being listed, images only appear for the Mushroom, Flower and Star. It also appears to sell Mushrooms, Bananas, Super Stars, ? Blocks, 1-Up Mushrooms and Fire Flowers. The logo consists of the word "Coco" written in a curved red all capital font with a dark blue outline and 3D effect, with "Burger" in the same orange font, and a paler shadow of the lettering behind the blue. A stylised image of a burger appears on the right hand side of the logo, with an orange polka dot shadow of it to the left, and a yellow background behind the whole thing. It is advertised by means of shops. A Coco Burger sign from Mario Kart 7. A Coco Mode poster from Mario Kart Wii. Coco Mode is a sponsor that appears in Mario Kart Wii and Mario Kart 7. The sponsor seems to be a clothes shop, selling various outfits for men, women and children, and also selling jackets. The logo consists of the company name written in a beige all capitals font with a small green clover-like symbol in a green circle to the left. The logo appears on various signs, one of which is simply the logo on a brown gradient background. The other sign uses the text but in burgundy, which is surrounded by a peach diamond and a dusty pink rectangle with burgundy stripes on either side. The poster features the logo in the bottom left corner in front of an image of a Mii wearing a blue and white jacket, whose head is randomly chosen from the Miis the player has saved on their Wii system. The background is gray with a cityscape in front of it and a cloud in the sky. It is advertised by means of shops and posters. A Coco Mode sign from Mario Kart Wii. 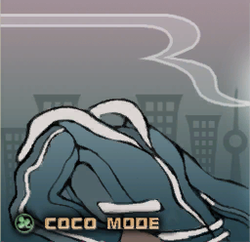 A Coco Mode sign from Mario Kart 7. Coco Outfitters is a sponsor that appears in Mario Kart Wii and Mario Kart 7. In Mario Kart Wii, the company appears as a fashion retailer selling various different shirts, however instead appears as a florist in Mario Kart 7. The logo uses a rounded all capitals peach font for the company's name with a cream glow effect around the outside. The background is pale brown with thin diagonal stripes and two rows of rainbow dots going across behind the text. It is advertised by means of shops. A Coco Outfitters sign from Mario Kart 7. A Coconut Cafe sign from Mario Kart 8. Coconut Cafe, originally written as Coconut Café, is a chain of cafés that appear as a sponsor in Mario Kart Wii, Mario Kart 8 and Mario Kart 8 Deluxe. The company's original logo from Mario Kart Wii featured the company name written in a white font, on a wooden board like background, spelled with an accented "e". The company's logo was updated in Mario Kart 8 to include a white image of a Pianta with a green skirt and leaves holding a coffee cup. The company name is still written in white, but now uses a different font and the name no longer has an accent on the "e", and has white zig-zag edging. It is advertised by its cafés alongside the courses and signs. In an earlier build of the game at the E3 demo, the Coconut Cafe in Toad Harbor was present and in the same location as the final game, however rather than using the redesigned logo for Mario Kart 8, it still used the old design with the different name from Mario Kart Wii. A Coconut Cafe trackside banner. The Mario Kart 8 pre-release screenshot, with the Mario Kart Wii logo for the Coconut Cafe. A Delfino Dream sign from Mario Kart Wii. Delfino Dream is a sponsor that appears in Mario Kart Wii and Mario Kart 7. The sponsor is a shop named after Isle Delfino which mainly sells different items of clothing but also appears to sell Mushrooms, Bananas, Super Stars, ? Blocks, 1-Up Mushrooms and Fire Flowers and is run by Piantas. Most notably, one of these shops is the one that the shortcut in Coconut Mall passes through. The logo consists of the company name in an all capitals brown font within a beige oval on a darker brown wooden background. It is advertised by means of shops. A Delfino Dream sign from Mario Kart 7. A Delfino Fruits poster from Mario Kart: Double Dash!!. Delfino Fruits (also called New Delfino Fruits) is a sponsor that appears in Mario Kart: Double Dash! !, Mario Kart DS and Mario Kart Wii. Presumably, is run by Piantas and sells Fruit from Isle Delfino. The main logo consists of the word "Delfino" written in a smaller purple font with a white outline and lines coming off the "O", similar to the logo of Super Mario Sunshine. "Fruits" is written underneath in a larger similar blue font, but also has white dots on the letters, and the whole logo has a shadow behind it and features three palm trees coming out from behind it. The poster variant has a yellow-brown background with a yellow border and a brown line separating the two, and also features artwork of fruit and various Piantas from Super Mario Sunshine. Some of these posters also have one of Shadow Mario's graffiti "M"s in the bottom right corner. The trackside banner variant uses the same text, but changes the color of "Delfino" to an olive green and "Fruits" to red. Two of the palm trees have also been removed, and a small blue oval has been added next to "Delfino" which says the word "New" in an all capitals white font. The yellow Pianta from the poster appears on the left of the banner and the blue one on the right, on a yellow and red background. The sign variant from Mario Kart DS and Mario Kart Wii solely consists of the main logo from the poster stretched out slightly, but does not feature any of the Piantas or fruit from underneath and appears in a darker rectangle. It is advertised by means of posters, signs and trackside banners. A Delfino Fruits trackside banner from Mario Kart: Double Dash!!. A Delfino Fruits sign from Mario Kart DS. A Delfino Fruits sign from Mario Kart Wii. A Delfino Fruits trackside banner from Mario Kart Wii. A Dream Gliders trackside banner from Mario Kart 8. Dream Gliders is a sponsor that appears in Mario Kart 8 and Mario Kart 8 Deluxe, and makes a cameo appearance in Super Smash Bros. for Wii U and Super Smash Bros. Ultimate. Presumably, the company produces the Gliders that the racers use after driving off a Glider Ramp. The main logo of the company consists of the name in white on top of a white line coming from a cloud, which leads to an image of Mario's Super Glider from above. The background has two variants, a daytime one with a light blue gradient, and an indigo gradient with yellow stars as a night time variant. It is advertised by means of trackside banners and signs, and is also referenced on a map. A Dream Gliders trackside banner. A Fountain Cafe trackside banner from Mario Kart 8. Fountain Cafe (originally spelled as Fountain Café) is a chain of cafés that appears as a sponsor in Mario Kart Wii, Mario Kart 7, Mario Kart 8, Mario Kart 8 Deluxe, and makes a cameo appearance in Yoshi's Crafted World. The original logo consists of the original name in a script font with an orange spiral on the left, on a green gradient background. The updated Mario Kart 8 logo consists of the word "Fountain" written in white inside a blue banner with a yellow outline, and the word "Cafe" underneath in yellow, with two coffee beans either side of the word. The logo also has variants, one of which removes the banner but adds a semi-circular outline to the words, and moves the coffee beans downwards and adds a white cup of coffee too, containing a swirl similar to the first logo. This version of the logo is the one that appears in Yoshi's Crafted World. Another variant consists of the two words next to each other to the right of the coffee cup, with one yellow line above it and two below. The other variant is just the coffee cup from the logo on an orange background instead. It is advertised by the shops that appear alongside the courses, signs, posters and bottles. A Mario Kart Wii Fountain Café sign. A Mario Kart 7 Fountain Café sign. A Mario Kart 8 Fountain Cafe sign. A Mario Kart 8 Fountain Cafe logo. A Fun Flower trackside banner from Mario Kart 8. Fun Flower is a florist that appears as a sponsor in Mario Kart Wii, Mario Kart 7, Mario Kart 8 and Mario Kart 8 Deluxe. The original logo consists of the company name written in all capitals using a mid-blue script font, with white and dark blue shading. This appears on a blue, white and peach gradient background, white a darker border around the edge. The main Mario Kart 8 logo consists of the word in white writing with a purple outline, underlining and border in a pale pink box with a darker pink outline. A Piranha Plant appears in between the two words, using a purple outline and the dark pink on the head. A variation of the logo retains the font, but has the Piranha Plant in regular colors on the left, a double white underlining and a blue border. Another addition to this logo is the two yellow butterflies in the top right hand corner. It is advertised by the shops that appear alongside the courses. A Mario Kart Wii Fun Flower sign. A Mario Kart 7 Fun Flower sign. A Mario Kart 8 Fun Flower logo. A Fuzzy Battery trackside banner. Fuzzy Battery is a type of battery that appears as a sponsor in Mario Kart 8 and Mario Kart 8 Deluxe, and makes cameo appearances in Super Mario Odyssey and Yoshi's Crafted World. The logo consists of the company name in a curled font, with a black and yellow gradient fill and a white outline surrounding a 2D image of a Fuzzy with the same color scheme. This appears on one of three backgrounds with a lightning bolt, one in which the bolt is yellow with a red outline on a black background, another in which the bolt is blue with a yellow outline and black background, and the other which is black with a yellow outline on a red background. It is advertised by means of trackside banners, promotional tents, signs, flags, patches and the batteries themselves. The top of a Fuzzy Battery promotional tent. 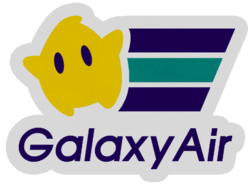 Galaxy Air (often abbreviated to GXA) is an airline that appears as a sponsor in Mario Kart 8 and Mario Kart 8 Deluxe, and makes a cameo appearance in Super Mario Odyssey. It runs flights to some of the courses from the game, so presumably transports the racers to these locations for the races. It is presumably named after Galaxies from Super Mario Galaxy and Super Mario Galaxy 2, or possibly even the games themselves. The logo consists of a simplified image of a yellow Luma alongside three stripes, two being dark blue and the other being turquoise, somewhat resembling a comet tail. Beneath this is the company name in a simple dark blue font. There are many variations of the logo however. One variation puts the stripes behind the Luma and gives it an outline, and "Galaxy Air" appears on the right hand side instead. This variant has many different color schemes. The other main variant shortens the stripes and adds GXA above Galaxy Air on the right hand side, and also comes in two variations. Another variation of the logo places the Luma on the left and the abbreviation over the full name on the right, while another simply has just the text in that arrangement. Another variant of this version of the logo has an orange background and white text, as well as removing the outline from the Luma and changing its eyes to orange, and the colors of the stripes to turquoise instead of dark blue and white instead of the original turquoise. As well as the variations, Galaxy Air also advertises using posters which illustrate specific destinations. One of these is for Dry Dry Desert, and features an image of GCN Dry Dry Desert as the background with the Galaxy Air logo in the top left corner. In front of this is a green dune shape which says "Mysterious Sands." and "Dry Dry Desert" on it, and features Toad's Mario Party 8 artwork on it. There is also a rectangular version of it which shows a smaller section of the course and places Toad above the dune. Another one is for Sweet Sweet Canyon and is fairly similar in layout, but now has a pink ribbon with a magenta and white trim at the bottom instead of dunes. This now reads "The Sweetest Memories!" and "Sweet Sweet Canyon" instead, and features Princess Peach's New Super Mario Bros. Wii artwork behind the ribbon instead, whereas Toad is in front. The rectangular variant has the same changes as the Dry Dry Desert one. The other poster is for Water Park, and is completely different from the other two. It has the Galaxy Air logo in the top right hand corner in a yellow trapezium, which also says "Welcome to Water Park", with the "Welcome to" in orange and the rest in red. below this is an orange stripe which has "New attraction!" written on it in yellow, accompanied by another orange stripe at the bottom. in between these stripes is an image of Water Park, specifically focussed on the Sub Coaster ride, which is most likely the new attraction, and the New Super Mario Bros. artwork of Koopa Troopa. Galaxy Air is advertised by means of posters, trackside banners, patches and signs, as well as appearing on planes, buses and departures boards, is mentioned by the airport intercom and appears on a varnish. The announcer on the intercom in Sunshine Airport mentions two flights provided by Galaxy Air, "Passengers departing on Galaxy Airlines, Flight 2580, bound for Dolphin Shoals, should proceed to customs and immigration at this time." and "Paging Galaxy Airlines, Flight 2218, passenger Ms. Birdo, please proceed to the information counter on Floor 2.". The intercom does get the company's name wrong in both of these announcements. In an earlier build of the game at an E3 demo, the starting line for Toad Harbor featured a blue starting line with Galaxy Air logos, however this was replaced in the final game with a yellow and orange one with Flower Cup logos and different textures. Galaxy Air flights from the Sunshine Airport departures board. A Galaxy Air trackside banner. A Galaxy Air Dry Dry Desert poster. A Galaxy Air Sweet Sweet Canyon poster. A Galaxy Air Water Park poster. A Green Shell Taxi logo. Green Shell Taxi is a taxi company that appears as a sponsor in Mario Kart 8 and Mario Kart 8 Deluxe, and makes a cameo appearance in Super Mario Odyssey. The company logo consists of the name in simple white writing with "Taxi" in capital letters, on a navy blue stripe, edged with another yellow stripe followed by another blue one on either side. At the end of the line is a 2D image of a Green Shell in monochrome green with a yellow outline. The other variant is seen on the roofs of the cabs, and consists of the words "Green Shell" in black on either side of the 2D artwork of the shell, on a yellow background. The company directly advertises by means of patches, is indirectly advertised by their cabs and is also referenced on a map. A Koopa Shop sign from Mario Kart Wii. Koopa Shop is a sponsor that appears in Mario Kart: Double Dash! !, Mario Kart DS and Mario Kart Wii. Presumably, the company is a chain of shops run by Koopa Troopas. Their original logo from Mario Kart: Double Dash!! consists of the company name in a pale green font in the bottom left corner in an all capitals font, with a curved orange border and teal background. The orange outline of a tessellated hexagon pattern like the back of a Koopa Troopa's shell appears on the right hand side, and fades into the teal background. The updated logo from Mario Kart DS consists of name in the same green font, but now places the words on top of each other and has a green background instead. The hexagon pattern is absent in this version of the logo. Another new logo was introduced in Mario Kart Wii, now using a curved all capitals blue font with white and black outlines and a black 3 dimensional perspective effect. The background is green with an orange outline. It is advertised by means of signs. A Koopa Shop sign from Mario Kart: Double Dash!!. A Koopa Shop sign from Mario Kart DS. A Koopa Sport trackside banner from Mario Kart: Double Dash!!. Koopa Sport is a sponsor that appears in Mario Kart: Double Dash!! and Mario Kart DS. Although it is ambiguous as to precisely what the company does, it appears to have some sort of relation to Koopa Troopa. The original logo from Mario Kart: Double Dash!! consists of the company name in a green and blue gradient all capitals font with a white outline on a red background. Six stars appear on either side of the text, with the middle two being white and the other four being yellow. The updated logo from Mario Kart DS is fairly similar, however now has yellow writing and is expanded to include a Shine Sprite on either side of the image. The other version of the Mario Kart DS logo uses the same layout but instead has a dark red background with a curved paler red outline. It is advertised by means of trackside banners. A Koopa Sport trackside banner from Mario Kart DS. A Koopa Kart trackside banner from Mario Kart 7. KoopaKart is a sponsor that appears in Mario Kart: Double Dash! !, Mario Kart DS, Mario Kart Wii and Mario Kart 7. Although it is ambiguous as to what the company does, it appears to have some sort of relation to Koopa Troopa. The main logo consists of the company name written in orange font with black shadow and the circles of the "O"s and "P" filled in with yellow, as well as small dashes at the bottom of the circles on the outside of the letter. The logo has a tessellated green hexagon background with a lime green outline around the hexagons, similar to a Koopa Troopa's Shell. A variant of this logo instead uses and all-black font instead of the orange one, with a variant of this instead using a gray hexagon background with a paler gray outline and another using light blue hexagons with a lighter blue outline and green circles in the "O"s and "P". Another version of the logo retains the same text, but uses a blue background with a horizontal white stripe on the left hand side. Another logo uses a yellow font instead, and does not fill in the circles in the letters, with a teal and light blue hexagon pattern background instead. An updated version of this logo also appears in Mario Kart Wii and Mario Kart 7, but instead uses an italic black font with yellow shadow and yellow outlines on the hexagons. It is advertised by means of trackside banners. A KoopaKart trackside banner from Mario Kart: Double Dash!!. A KoopaKart trackside banner from Mario Kart DS. A KoopaKart trackside banner from Mario Kart Wii. A KoopaKart trackside banner from Mario Kart 7. A Lady Coco sign from Mario Kart Wii. Lady Coco is a sponsor that appears in Mario Kart Wii and Mario Kart 7. Apparently, the sponsor appears to be a clothing store that sells dresses. The company name on the logo is written in a pink all-capitals serif font with a shadow effect behind the text. The background is peach with a series of ovals starting on the left alternating from off-white to dusty dink. It is advertised by means of shops. A Lady Coco sign from Mario Kart 7. A Luigi Grand Prix trackside banner from Mario Kart 7. Luigi Grand Prix is a sponsor that appears in Mario Kart: Double Dash! !, Mario Kart DS, Mario Kart Wii and Mario Kart 7. Presumably, the company organises some of the grand prix and is run by Luigi. The original logo from Mario Kart: Double Dash!! consists of a blue and black version of Luigi's emblem in a black box with blue flourishes at the bottom on a white background. The company name appears to the left of it, with "Luigi" in a burgundy all capital font, except for the lower case "I"s, at the top, and "Grand Prix" in a black all capital font at the bottom. The same logo is used in Mario Kart DS, but now lacks the emblem part at the side. The logo was completely redesigned in Mario Kart Wii and Mario Kart 7 based on the logo of Luigip, with a yellow background with the same text, and changing the logo to a black one with a stylized version of Luigi's face in a box. It also shared a trackside banner with Super Mario in Mario Kart Wii, with the original Luigi Grand Prix logo on the left and the black and red Super Mario one on the right, with a gray tessellated, white-outlined hexagon background. It is advertised by means of trackside banners. A Luigi Grand Prix trackside banner from Mario Kart: Double Dash!!. A Luigi Grand Prix trackside banner from Mario Kart DS. A Luigi Grand Prix / Super Mario trackside banner from Mario Kart DS. A Luigi Grand Prix trackside banner from Mario Kart Wii. A Luigi Grand Prix / Super Mario trackside banner from Mario Kart Wii. A Luigi Oil trackside banner from Mario Kart: Double Dash!!. Luigi Oil is a sponsor that appears in Mario Kart: Double Dash!! and Mario Kart DS. Presumably, the company supplies oil for the Karts and is run by Luigi. Their logo consists of the company name in a turquoise gray-outlined font like the one used in the Luigi's Mansion logo, with the center of the "G" filled in blue and the center of the "O" filled in orange. It has a white outline and a small amount of shadow beneath it, with a purple checkered background. It is advertised by means of trackside banners. A Luigi Racing Team logo from Mario Kart: Double Dash!!. Luigi Racing Team is Luigi's racing team and a sponsor in Mario Kart: Double Dash!! and Mario Kart DS. The logo consists of an image of Luigi with his arms folded on a white background, with a green circle surrounding him. The circle has a darker green ring on both edges and a single yellow star on either side, with the team name written both at the top and the bottom between them in an all capitals white font. There is also a white circle around the main green one. It is advertised by means of signs. A Luigi Tires trackside banner from Mario Kart Wii. Luigi Tires is a sponsor that appears in Mario Kart: Double Dash! !, Mario Kart DS and Mario Kart Wii. Presumably, the company is a tire provider and is run by Luigi. The original logo from Mario Kart: Double Dash!!. The original logo from Mario Kart: Double Dash!! consists of the company name written in an all capitals font with a black outline and an orange and yellow gradient fill. The background is deep blue with a white diagonal stripe on the left hand side. The logo was updated in Mario Kart Wii, and now consists of the name in a gray font made up of cut out circles, apart from the "I"s. The background is red at the top and white at the bottom, and a red and white tire now appears on either side. Another updated logo was introduced in Mario Kart Wii, which had the company name written in an all capitals font, except for the lower case "S". It has an orange and yellow gradient and a black outline and 3D effect. The text appeared in a white circle on a red background. It is advertised by means of trackside banners. A Luigi Tires trackside banner from Mario Kart: Double Dash!!. A Luigi Tires trackside banner from Mario Kart DS. A Mario Kart banner from Mario Kart: Double Dash!!. Mario Kart is a sponsor that appears in Mario Kart: Double Dash! !, Mario Kart DS and Mario Kart Wii. The main company logo is based on that of Nintendo's, using the same format and font, but with different text. This logo also lacks the registered trademark sign, apart from some of the Mario Kart DS and Mario Kart Wii ones, and also comes in different color variants. One has golden text on a burgundy background, another has red text on a white background, one has white text on a black background and the final one has white text on an orange background. It is advertised by means of trackside banners and banners. A Mario Kart trackside banner from Mario Kart: Double Dash!!. A Mario Kart trackside banner from Mario Kart DS. A Mario Kart trackside banner from Mario Kart Wii'. A Mario Kart trackside banner from Mario Kart Wii. A Mario Kart logo from Mario Kart 8. Mario Kart is a type of oil that appears as a sponsor in Mario Kart 7, Mario Kart 8 and Mario Kart 8 Deluxe, and makes a cameo appearance in Super Smash Bros. for Wii U and Super Smash Bros. Ultimate. Their logo consists of the Mario Kart logo in red with a white outline below two checkered flags and a Mushroom, on a yellow and blue striped background. A black Nintendo logo can also be seen on the back of the cans above the blue stripes at the bottom. It is advertised by means of oil cans that appear alongside the courses. A Mario Kart trackside banner from Mario Kart 7. Mario Kart is a sponsor that appears in Mario Kart: Double Dash! !, Mario Kart DS, Mario Kart Wii and Mario Kart 7. The main logo consists of an artwork of a red Toad originating from Super Mario Sunshine gesturing towards the lettering, which is written in a white all capitals font with the centers of the "A"s replaced with stars. The logo comes on two backgrounds, a red one with burgundy checkering in the top left and bottom right corners, and a pink one with red checkering in the bottom right corner. It is advertised by means of trackside banners. A Mario Kart / Nintendo GameCube sign from Mario Kart: Double Dash!!. Mario Kart / Nintendo GameCube is a sponsor that appears in Mario Kart: Double Dash!! and Mario Kart Wii. 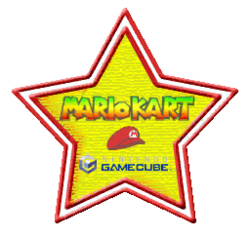 The logo is a yellow star with "Mario Kart" written at the top in the series' original font, with a Nintendo GameCube logo at the bottom. It has two variants, one with a double red outline and Mario's cap between the two logos, and one with a triple blue outline and a Freezie in the middle, with the Mario Kart logo in a blue gradient. It is advertised by means of signs. A Mario Kart / Nintendo GameCube sign from Mario Kart Wii. A Mario Motors poster from Mario Kart 8. Mario Motors is a company that appears as a sponsor in Mario Kart 8 and Mario Kart 8 Deluxe, and makes cameo appearances in Super Smash Bros. for Wii U, Super Mario Odyssey, and Super Smash Bros. Ultimate. The company appears to function as both a mechanic and a manufacturer of the Kart parts, run by Mario, and shares its name with a canceled Nintendo DS game which was meant to involve sculpting car parts. Their main logo consists of the company name in orange with a thick black outline and shadow, on a beige background with chequered borders. Alongside the name is an artwork of Mario from Famicom Grand Prix II: 3D Hot Rally holding a Tire. The logo also has several variants, the main ones being trackside banner versions with the words next to each other. Two of these change the text from orange to white and the outlines from black to orange on a red background, with white and orange checks respectively. The other variant is the one used for the signs, with features the words next to each other and the artwork of Mario on top. It is advertised by means of signs, promotional tents, trackside banners, garages, patches, stickers and logos. A Mario Motors trackside banner from Mario Kart 8. A Mario Motors logo from Mario Kart 8. Mario and Toads' Mario Kart 8 Artwork. Mario and a Toad's Mario Kart 8 Artwork. A Mario Motors patch from Super Mario Odyssey. A Mario Racing trackside banner from Mario Kart: Double Dash!!. Mario Racing is sponsor that appears in Mario Kart: Double Dash! !, Mario Kart DS and Mario Kart Wii. The logo consists of the company name in a deep red font with an orange outline on a darker red background, with a Shine Sprite between the two words. A version of this logo also exists using a gray and white gradient background, and another with a plain orange one. A poster variant also appears, which instead has the text in pink with a white outline on a paler pink background. The words are also now on top of each other, with the Shine Sprite on the top next to "Mario". Another logo has the name written in a script version of the font using the original colors on a blue background. The other logo has the company name written in a lilac font with a purple outline on a white background, with artwork of a male blue Noki blowing into a conch shell from Super Mario Sunshine on the left of the text. It is advertised by means of posters and trackside banners. A Mario Racing poster from Mario Kart: Double Dash!!. A Mario Racing trackside banner from Mario Kart Wii. A Mario Racing poster from Mario Kart Wii. A Mario Work Gear poster from Mario Kart 8. Mario Work Gear is a sponsor that appears in Mario Kart 8 and Mario Kart 8 Deluxe and makes a cameo appearance in Super Mario Odyssey. Presumably, the company, run by Mario sells work gear such as gloves and overalls. The logo consists of the company name in a sans-serif simple black font, with the "M" replaced with Mario's emblem, in a white circle with a black outline. Alongside the circle is a pair of gloves and overalls like Mario's, in the main 2D style, appearing to be presenting the rest of the logo, all on a white background. There are also two variants, the trackside banner variant, which uses a light blue background and removes the white circle except around the "M", and the other poster, which has a red background. It is advertised by means of posters, signs, shops and trackside banners. 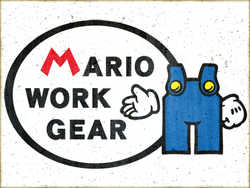 A Mario Work Gear trackside banner from Mario Kart 8. A Mario Work Gear patch from Super Mario Odyssey. A Moo Moo Meadows Milk logo from Mario Kart 8. Moo Moo Meadows Milk is a sponsor that appears in Mario Kart 8 and Mario Kart 8 Deluxe, and makes a cameo appearance in Yoshi's Crafted World. Presumably, the company milks the Moo Moos in Moo Moo Meadows and sells the milk, similar to Moo Moo Dairy and Mario Kart Milk from Mario Kart Wii. The main logo features a picture of a Moo Moo from the stamp unlocked after beating a staff ghost on Wii Moo Moo Meadows on a red background, with the company name on the right. "Moo Moo Meadows" is written in white, while "Milk" is written in the same red as the background with a white outline. The trackside banner variant is very similar, but uses larger text, and also has another Moo Moo on the right hand side. Another logo variant uses a blue and white Moo Moo on the right, with a blue background and white edges. The writing remains mostly the same, except the colors of "Milk" are reversed. The final variant appears on the cartons of milk themselves, and is a red and white Moo Moo on a white background with a red stripe, and he word "Milk" written in red underneath it. Two different variants of the logo appear on the cartons in Yoshi's Crafted World, both of which are similar to the other logos but have the text colored white with black and white outlines and a fully colored Moo Moo's head. One of the logos positions the head to the right of the text on a plain blue background, while the other positions the head over the text on a white stripe, with blue rectangles ith white and black borders on either side. It is advertised by means of trackside banners, posters, cartons, menus, stickers, vending machines, logos and trucks. A Moo Moo Meadows Milk trackside banner. A Moo Moo Meadows Milk logo. A Mushroom Piston logo from Mario Kart 8. 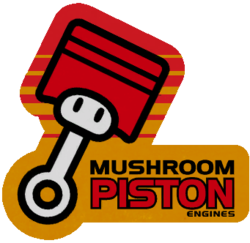 Mushroom Piston (also called Mushroom Piston Engines) is a sponsor that appears in Mario Kart 8 and Mario Kart 8 Deluxe, and makes a cameo appearance in Super Smash Bros. for Wii U and Super Smash Bros. Ultimate. Presumably, the company manufactures and distributes pistons and engines that are fitted in the Karts, Bikes and ATVs and resemble Mushrooms. The main logo consists of the company name in an all capitals sans-serif font, with "Mushroom" and "Engines" in solid black and "Piston" in red with a black outline. To the left of this is an angled piston in white and red stylized to look like a Mushroom. The entire logo appears in an orange and red striped gradient background, shaped around the logo. Most of the variants have a square or rectangular shape, one of which features Toad in his Tri-Speeder with Standard tires. The other significantly different variation is the trackside banner one, which uprights the piston and moves "Engines" to the right of the other text, but otherwise remains the same. Another set of variants has the company name written in a pale gray font either side of the engine parts of the Circuit Special, with a purple, orange, red or blue background depending on the varnish color. One variant simply has the piston upright on a green background, while a variation of the trackside banner logo uses a monochrome yellow logo on an orange background with no detailing. The other trackside banner variant resizes the word "Piston" and changes it to the same font as "Mushroom", and also moves the word "Engine" along towards it. It is advertised by means of stickers, posters, trackside banners, logos and signs, is referenced on a map and appears on varnishes. A Peach Grand Prix poster from Mario Kart: Double Dash!!. Peach Grand Prix is a sponsor that appears in Mario Kart: Double Dash! !, Mario Kart DS and Mario Kart Wii. Although what the sponsor does is ambiguous, it apparently has some relation to Princess Peach. The original logo from Mario Kart: Double Dash!! consists of a picture of Peach holding her parasol from Super Mario Sunshine with the text in an all capital white font to the right. The first "P" in "Peach" is blue, while the first "P" in "Prix" is yellow as well as the whole word being underlined. A red speech bubble containing the word "Welcome" in white appears next to the word "Prix", and the whole logo has a pale pink background. It has a rounded white border with deep pink around the edge, and small paler pink hearts in each corner. The updated logo from Mario Kart DS was styled similarly to the original Luigi Tires logo, using an all capitals black outlined font with a yellow and orange gradient fill. It has a dark blue background and a white border, with the words "Grand" and "Prix" placed on top of each other. The same text is used in the other Mario Kart DS Peach Grand Prix logo, but instead with a black outline instead of shadow and appears in a white circle with blue at the edges. It is advertised by means of trackside banners and posters. A Peach Grand Prix trackside banner from Mario Kart DS. A Peach Grand Prix poster from Mario Kart Wii. A Princess Daisy logo from Mario Kart: Double Dash!!. Princess Daisy is a sponsor that appears in Mario Kart: Double Dash! !, Mario Kart DS, Mario Kart Wii and Mario Kart 7. It is the main logo featured on and around the Daisy Cruiser, and is named after Princess Daisy. The main text used in all variants of the logo consists of the word "Daisy" in an italicized serif font with curved serifs outlined in brown with an orange gradient fill, between the two tones of Daisy's dress. The word "Princess" appears on top, using the same font and outline color but with a teal fill the same color as Daisy's jewels, apart from the "N" and the "C", which keep the orange gradient and form the dot of the "I" in "Daisy". A small version of the flower from Daisy's Emblem appears next to the logo, but instead has brown petals and a deep orange fill, with a golden orange outline around the center. On the Daisy Cruiser from Mario Kart: Double Dash!! and Mario Kart Wii, the logo is accompanied by an image of Daisy on a deep orange background with golden orange and brown outlines. This is surrounded by white petals on an orange background, a white and then brown outline. One variant includes this picture on the left of the text, another on both sides, while another one adds an orange background and adds the text over the image. In Mario Kart DS, signs were introduced using simply the text on a plain wooden backboard, but changed the blue fill of "Princess" to orange. The signs return in Mario Kart Wii, but have now been updated to retain the blue and add an outline on the background. The icon of Daisy was completely redesigned in Mario Kart 7, now using new artwork of her from the game within her updated Emblem, but in the same arrangement, though the text remained entirely the same. It is advertised by means of logos and signs. A Princess Daisy sign from Mario Kart DS. A Princess Daisy sign from Mario Kart Wii. A Princess Daisy logo from Mario Kart Wii. 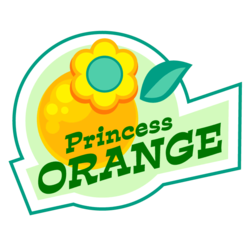 A Princess Orange logo from Mario Kart 8. Princess Orange is a sponsor that appears in Mario Kart 8 and Mario Kart 8 Deluxe, and makes a cameo appearance in Yoshi's Crafted World. The company seems to produce and sell a fizzy orangeade drink, and is mainly run by Princess Daisy. The main logo consists of an orange with a green leaf and Daisy's flower emblem on it, with the company name in a green serif font in front of it. The logo is surrounded by a mint green shape with white and turquoise outline. The logo has some variants, the main one being the trackside banner one which changes the text to white and moves it to the left of the orange and removes the background shapes. This variant has a green background and encircles the logo in mint green and turquoise. Another variant changes the background to green and text to white, removes the turquoise shape and changes the outline color from white to mint green. The other variant uses the white text and an orange background, while encircling the logo in the same yellow and turquoise as the flower. There is also a different logo variation, which puts the main green text to the right of the orange, and surrounds it with a green bubble, with a white outline around the entire logo. The company is advertised by means of bottles, posters, shops, stickers, menus, logos and trackside banners, appears on varnishes and is also referenced on a map. A Princess Orange trackside banner. A Rainbow Exploration Agency trackside banner. The Rainbow Exploration Agency (often abbreviated to REXA) is a sponsor that appears in Mario Kart 8 and Mario Kart 8 Deluxe, and makes a cameo appearance in Super Mario Odyssey. Presumably, the company is a space agency run by Toads, which specifically explores Rainbow Roads. Their logo consists of a blue globe with red and yellow rings surrounding it. The abbreviation appears next to it in a navy blue serif font, and the entire logo is surrounded by a white outline. The full company name appears to the right of this, in a sans-serif font. This appears by itself on a white background in Super Mario Odyssey. The company also has a poster, which features the logo in the bottom right corner in front of the image of the Yellow Toad and Blue Toad from the Online Menu in space in front of a planet, along with a Mario Kart TV satellite. The company is advertised by means of posters, logos, trackside banners, space station elements, patches, holograms, and is also referenced on a map. A Rainbow Exploration Agency poster. A Red Shell Strike Equipment logo. Red Shell Strike Equipment is a sponsor that appears in Mario Kart 8 and Mario Kart 8 Deluxe, and makes a cameo appearance in Super Mario Odyssey. Presumably, the company distributes items that are thrown in races, mainly Red Shells. Their logo consists of a 2D image of a Red Shell, with "Red Shell" written in red next to it, and "Strike Equipment" in a smaller black font underneath. The background is light blue, with a yellow flame behind the writing and Shell. There is also a trackside banner variant of the logo, which uses a smaller Shell, puts the words "Red" and "Shell" next to each other, as opposed to on top of each other, and also stretches out the background slightly to fit. It is advertised by means of trackside banners, signs, patches and stickers. A Red Shell Strike Equipment trackside banner. A Ribbon 86 poster from Mario Kart: Double Dash!!. Ribbon 86 is a sponsor that appears in Mario Kart: Double Dash!! and Mario Kart DS. It is fairly ambiguous to what the company does, however "Super Famicom Magazine" can be seen in the top right hand corner, suggesting it may be a publication. A poster for Ribbon 86 is also Birdo's only cameo appearance in Mario Kart DS. The logo consists of the word "Ribbon" in an all capitals italicized font, with "86" in black and underlined beneath it. An image of Birdo appears in front of it, with "Birdo Watching!" in a white all capitals font in front of her. "Super Famicom Magazine" appears in the top right corner in a black all capital font. The background is of one of the patches of flowers that make up Yoshi's spines in Yoshi Circuit, and the whole poster has a dark blue outline. It is advertised by means of posters. A Roy Smooth Sounds logo. Roy Smooth Sounds is a sponsor that appears in Mario Kart 8 and Mario Kart 8 Deluxe, and makes a cameo in Super Smash Bros. Ultimate. Presumably, the company produces sound equipment such as speakers and stereos, and is run by Roy Koopa. 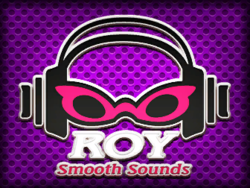 The logo consists of a pair of Roy's sunglasses and a pair headphones, with "Roy" written in an all capital serif font, and "Smooth Sounds" written in pink underneath it, with the entire logo outlined in white and on a purple polka dot background. The logo also has a few variants, one of which has the only difference of having a yellow dotty background instead, and the other one has gray and white dot background and changes the pink to red. Another variant of the logo solely consists of the text in black on a white background. It is advertised by means of signs, bottles and logos. A Shell Island trackside banner from Mario Kart Wii. Shell Island is a sponsor that appears in Mario Kart Wii and Mario Kart 7. Presumably, the sponsor is some sort of tourist promotion for either the island Koopa Cape is situated on or a nearby island, and is apparently named after some sort of Shell. The logo consists of an artwork of a Green Shell behind the company name in a light blue all-capitals font with a darker blue outline. The logo is surrounded by a rectangle with rounded corners in the same colors, and has a red gradient checkered background. In Mario Kart 7, the logo is updated slightly, retaining the same text and background, but moves the shell over to the left and places it alongside a smaller version of the writing. It is advertised by means of trackside banners. A Sherbet trackside banners from Mario Kart 7. Sherbet is a sponsor that appears in Mario Kart: Double Dash! !, Mario Kart DS and Mario Kart 7. Presumably, the company is a brand of sherbet sweets. The original logo from Mario Kart: Double Dash!! consists of the word "Sherbet" in a white all capital font, with a five pointed snowflake shape to the right. The text appears on a yellow oval with a green background surrounding it. The updated version of the logo from Mario Kart DS uses the same text, but instead with a light blue oval and a mid blue background. The oval is outlined in pale blue, with two dark blue stripes on either side. It is advertised by means of trackside banners. A Sherbet trackside banner from Mario Kart: Double Dash!!. A Sherbet trackside banner from Mario Kart DS. A Shoot!! trackside banner from Mario Kart: Double Dash!!. Shoot!! (also formatted as Shoot!) is a sponsor that appears in Mario Kart: Double Dash! !, Mario Kart DS, Mario Kart Wii and Mario Kart 7. It appears to be based on the sponsor Shot! from Mario Kart 64. The main logo consists of the company name in a red italic all capital font, with white and black outlining. A 2D image of a Red Shell appears in a gray circle next to it that also has white and black outlines. Two black stripes appear behind the logo, and the whole thing has a pale gray background. The logo also has two variants, one of which has a yellow background instead of gray, and another which is simply the shell in the circle and a small rectangle of background. A new logo for the "Shoot!" version of the sponsor appears in Mario Kart Wii, which has the logo written in a black font on the right, the Red Shell on the left and a white background. It is advertised by means of trackside banners and signs. A Shoot!! trackside banner from Mario Kart Wii. A Shoot! trackside banner from Mario Kart Wii. A Shooting Star trackside banner from Mario Kart 7. Shooting Star is a sponsor that appears in Mario Kart Wii and Mario Kart 7. The original Mario Kart Wii logo consists of the company name written in a red-outlined, underlined transparent font, making it the color of the background, with angular "S"s within rectangles and a star in the middle of the "g". The background is light gray with a darker gray star pattern around the text. In Mario Kart 7, the logo uses an all capitals dark green outlined and underlined font with a yellow and lighter green gradient fill. A row of twelve orange stars appear under the underlining, and a yellow diagonal stripe with white stars appears in the top left corner, with the whole logo having a white background. It is advertised by means of trackside banners. A Shooting Star trackside banner from Mario Kart Wii. A Skating Rink trackside banner from Mario Kart 7. Skating Rink is a sponsor that appears in Mario Kart: Double Dash! !, Mario Kart DS and Mario Kart 7. Presumably, it is a skating rink which appears to be located in Sherbet Land. The main logo from Mario Kart: Double Dash!! consists of the company name in a white italic font, with a large curl added onto the "G" in "Skating". Small white flourishes appear on either side of the "G"'s curl and all of the text is located in a dark blue oval. A Shy Guy appears on either side of the oval, and the whole logo has a light blue background. This logo was slightly updated in Mario Kart 7 to now add a mid blue outline around the oval and now uses 2D artworks of Shy Guys instead of 3D ones. The other logo uses a different underlined whit font for the name and has a blue background, with a pink Skating Shy Guy between the two words instead. It is advertised by means of trackside banners. A Skating Rink trackside banner from Mario Kart: Double Dash!!. A Skating Rink trackside banner from Mario Kart DS. A Snowman trackside banner from Mario Kart 7. Snowman (also formatted as *Snowman) is a sponsor that appears in Mario Kart: Double Dash! !, Mario Kart DS and Mario Kart 7. The main logo consists of the company name with the asterisk in an all capitals white font with a pale striped white reflection underneath it on a bright pink background. The logo also has a few variants, one of which uses a similar font but has no reflection and adds a gray gradient into the letters. The background is red and a Snowman appears on each side of the logo. A version with a similar layout appears in Mario Kart DS, but removes the gradient on the lettering and changes the background to a yellow and orange gradient. It is advertised by means of trackside banners. A Snowman trackside banner from Mario Kart: Double Dash!!. A Snowman trackside banner from Mario Kart DS. A Sunshine logo from Mario Kart Wii. Sunshine is a sponsor that appears in Mario Kart: Double Dash!! and Mario Kart Wii. It is the logo of Princess Peach's cruise ship, the Sunshine, and references Super Mario Sunshine. The logo consists of a Shine Sprite with a red outline in a red circle with a yellow outline. The word "Sunshine" is curved around the top of the logo in red, using the title font of Super Mario Sunshine, with a red and white striped background. It is advertised by means of logos. A Sunshine logo from Mario Kart: Double Dash!!. A Sunshine Parts poster from Mario Kart 8. Sunshine Parts is a sponsor that appears in Mario Kart: Double Dash! !, Mario Kart DS, Mario Kart Wii, Mario Kart 7, Mario Kart 8 and Mario Kart 8 Deluxe. Presumably, the company produces and distributes parts for the various vehicles used in the races. The original logo from Mario Kart: Double Dash!! consists of the company name in an all capital brown font, with the final "S" in lower case, alongside an image of a Shine Sprite. The "U" is also stylized to resemble a Shine Sprite, and the logo appears on a yellow background with a brown and white border, as well as a yellow Mario Kart logo and star on a red corner. This game's variant had "Sunshine" written in white on a red background with a blue and white border, as well as a blue corner behind the Mario Kart logo. A trackside banner version of the yellow background logo appears in Mario Kart DS, but lacks any border and the Mario Kart logo from the corner. In Mario Kart Wii and Mario Kart 7, however, the logo used is the original one from Mario Kart: Double Dash! !, bringing back the elements missing from the Mario Kart DS version. The Mario Kart 8 version is similar to the original, but now has all white text, a blue background and a brown and white border. It is advertised by means of posters, signs and trackside banners. A Sunshine Parts poster from Mario Kart: Double Dash!!. A Sunshine Parts trackside banner from Mario Kart DS. A Sunshine Parts trackside banner from Mario Kart Wii. A Super Mario trackside banner from Mario Kart: Double Dash!!. Super Mario is a sponsor that appears in Mario Kart: Double Dash! !, Mario Kart DS, Mario Kart Wii and Mario Kart 7. Although what the sponsor does is ambiguous, it is named after the form Mario takes after collecting a Super Mushroom. The main logo consists of the company's name in an all capitals font with the words on top of each other, with a larger "S" on the left and "O" on the right, with a dividing line through them extending the line between the two words. A pair of Super Stars appear on the left of the text, though only the top one has eyes. The logo has many color schemes, one of which has "Super" in blue and "Mario" and the Stars in red on a pale gray background with a white border, with a variant of this only having a solid white circle in the background with red on either side. Another has "Super" in dark blue and "Mario" in white with yellow Stars and a mid blue background, with a variation of this one having dark blue and white checkered sections at the sides, while the other variation from Mario Kart: Double Dash!! adds a white glow and shadow to the logo, with the Stars and "Mario" in a yellow and orange gradient and "Super" in block red on a green polka dot background. The Mario Kart DS variations both lack the Super Stars, one of which has the small text in blue and the larger letters with a yellow and orange gradient on a white background. The other has the larger letters in red and the smaller ones in white on either a blue or green background with a black stripe, as well as a adding a set of nine silver gradient stars on either side of the logo. In Mario Kart Wii a new logo was introduced on a trackside banner that it shared with Luigi Grand Prix. It featured the main logo on the right with a red "S" and "O" and black for all of the other letters, with the Luigi Grand Prix logo on the left and a tessellated gray hexagon background with white outlines. It is advertised by means of trackside banners. A Super Mario trackside banner from Mario Kart DS. A Super Mario / Luigi Grand Prix trackside banner from Mario Kart DS. A Super Mario trackside banner from Mario Kart Wii. A Super Mario / Luigi Grand Prix trackside banner from Mario Kart Wii. A Super Mario GP trackside banner from Mario Kart: Double Dash!!. Super Mario GP is a sponsor that appears in Mario Kart: Double Dash! !, Mario Kart DS, Mario Kart Wii and Mario Kart 7. Although it is ambiguous as to what the company does, GP likely stands for Grand Prix and it is named after the form Mario takes after collecting a Super Mushroom. The logo consists of the word super in an all lower case font with a blue fill and white outline, and blue speed lines coming off the right hand side of the "R". The word "Mario" appears underneath in an all capitals white font with a black outline, and "GP" to the right of that in a yellow italic font with more speed lines. The background is purple checkered with a white border in Mario Kart: Double Dash!! but just solid purple in Mario Kart DS. An alternate version of the logo appears in Mario Kart DS and Mario Kart Wii which instead uses a red checkered background. It is advertised by means of trackside banners and signs. A Super Mario GP trackside banner from Mario Kart DS. A Super Mario GP trackside banner from Mario Kart Wii. A Super Mushroom trackside banner from Mario Kart 7. Super Mushroom is a sponsor that appears in Mario Kart: Double Dash! !, Mario Kart DS, Mario Kart Wii and Mario Kart 7. Although what the company does is ambiguous, it is named after the Super Mushroom. The main logo consists of the word "Super" in a dark blue all capitals font with a yellow star on either side above the word "Mushroom" in the same font but in red and with shadows added. The logo has several variations, one of which places the logo in a white circle on a red background, and another that places it on a background made up of green tessellating hexagons. The other variation uses a white circle and a sky blue background, as well as changing the color of the word "Mushroom" to the same sky blue. Another logo appears in Mario Kart Wii which uses the same logo but instead buts it on a yellow background with a paler yellow border. It is advertised by means of trackside banners. A Super Mushroom trackside banner from Mario Kart: Double Dash!!. A Super Mushroom trackside banner from Mario Kart DS. A Super Mushroom trackside banner from Mario Kart Wii. A Super Star! sign from Mario Kart: Double Dash!!. Super Star! is a sponsor that appears in Mario Kart: Double Dash!! and Mario Kart DS. Although what the company does is ambiguous, it is named after the Super Star. The main logo consists of the word "Super" in an all capitals yellow font and "Star!" in white, with the "A" replaced with a Super Star, and three white dashes above it. The background is blue with a white stripe in the top left and bottom right hand corners, and shadow underneath the text. Another logo is introduced in Mario Kart DS, which uses the same font but on a different background which is red at the top behind the text and white at the bottom behind the shadow. It is advertised by means of trackside banners and signs. A Super Star! trackside banner from Mario Kart: Double Dash!!. A Super Star! trackside banner from Mario Kart DS. A Super Wario trackside banner from Mario Kart: Double Dash!!. Super Wario is a sponsor that appears in Mario Kart: Double Dash! !, Mario Kart DS and Mario Kart Wii. Although it is ambiguous as to what the company does, it is named after the Super form of Wario. One of the logos consists of the name in a black outlined 3D perspective font, with "Super" in red and "Wario" in lilac, with Wario's face in the middle. The background is green with a white stripe in the middle, and two white stars appear on wither side of Wario's face. The other logo is a parody of the Super Mario sponsor from Mario Kart: Double Dash! !, using the same layout and font, even simply flipping the "M" upside down to create the "W", however the Super Wario incarnation lacks the line through the middle of the two larger letters and outlines the text and the Super Stars in black. The Super Stars and word "Super" are yellow, and the word "Wario" is purple. It is advertised by means of trackside banners and signs. In an early version of the game shown in the 2007 E3 trailer, a Super Wario sign using the logo with Wario's face in the middle could be seen near the starting line of Wario's Gold Mine. In the final version of the game it is replaced with a generic Wario's Gold Mine sign instead. A Super Wario trackside banner from Mario Kart DS. A Super Wario trackside banner from Mario Kart Wii. A Mario Kart Wii early build trailer screenshot, with the Super Wario sign in Wario's Gold Mine. A Tropical Bakery sign from Mario Kart 8. Tropical Bakery is a sponsor that appears in Mario Kart Wii, Mario Kart 8, Mario Kart 8 Deluxe, and makes a cameo appearance in Yoshi's Crafted World. Presumably, the company is a bakery chain. The original logo from Mario Kart Wii consists of the company name in a curvy white font with yellow edges on a peach background. The background also includes pink bubbles with a yellow outline, and also has a two colored pale yellow and peach border. The updated Mario Kart 8 and Yoshi's Crafted World logo is completely different, using a white gothic font with a dark green outline on a green background with a white border instead. This version of the logo puts the words on top of each other, and also features a green and yellow chevron design along the bottom of the image. This version also has a trackside banner variant, which puts the words alongside each other and adds a chevron to the top of the banner as well. It is advertised by means of shops, signs and bottles. A Tropical Bakery sign from Mario Kart Wii. A Tropical Bakery trackside banner from Mario Kart 8. A Tropical Grocery sign from Mario Kart 8. Tropical Grocery is a sponsor that appears in Mario Kart Wii, Mario Kart 8 and Mario Kart 8 Deluxe. The company appears to be a chain of grocery stores, and sells products such as Double Cherries. Their original logo from Mario Kart Wii is stylized to look like a crate, with a darker wood effect border and a paler wooden center, with the "Tropical Grocery" seemingly printed on in a dark brown, all capitals serif font. The logo is completely redesigned in Mario Kart 8, instead using a black underlined sans-serif font for the word "Tropical" and a white all capital font in a red box for "Grocery". The entire logo has a white background, and also features the artwork of the Double Cherry from Super Mario 3D World. This version of the logo also has a trackside banner variant, which puts the two words closer together and moves the image of the Cherries to the far left hand side of the image. It is advertised by means of shops and signs. A Tropical Grocery sign from Mario Kart Wii. A Tropical Grocery trackside banner from Mario Kart 8. A Waluigi Grand Prix trackside banner from Mario Kart: Double Dash!!. Waluigi Grand Prix (often abbreviated to WΓGP) is a sponsor that appears in Mario Kart: Double Dash! !, Mario Kart DS and Mario Kart Wii. Although it is ambiguous as to what the sponsor does, it appears to have some relation to Waluigi. The main logo consists of the initials in a white font in pale blue circles, with the exception of the "Γ", which is colored yellow to match Waluigi's Emblem. "Waluigi Grand Prix" appears underneath in a different all capitals white italic font, with two white stars on either side of the logo. The background is dark blue and has a border which matches the pale blue color of the circles. The Mario Kart DS version uses the same layout, but uses burgundy circles, black text ad stars underneath, a pale gray background and a white border. Another version of the logo from Mario Kart DS uses the same layout as the original, but with a dark green background, light green border and circles and a pink "Γ". The other Mario Kart DS version is also fairly similar, but puts a black stripe behind the full name, uses a yellow background and "Γ" with a paler yellow border and purple circles. In Mario Kart Wii, another trackside banner for the sponsor which it shared with Yoshi's Egg was introduced, with the Waluigi Grand Prix text and stars at the bottom in black and the black, green and white Yoshi's Egg logo above it. The background is yellow with a paler silhouette of a Yoshi Egg in the middle and an outline the same color. Another sign which it shares with Yoshi's Egg also appears in Mario Kart Wii, although the sponsor is just named as "Grand Prix", which is written in a dark blue stripe across the bottom in a white font with only a single star on either side of the text. The black and green Yoshi's Egg logo appears above it, with a white "Y" in a yellow outlined green circle above that. The sign is shaped and designed like a green Yoshi Egg with five spots and has a yellow outline. It is advertised by means of trackside banners and signs. A Waluigi Grand Prix trackside banner from Mario Kart DS. A Waluigi Grand Prix / Yoshi's Egg trackside banner from Mario Kart DS. A Waluigi Grand Prix trackside banner from Mario Kart Wii. A Waluigi Grand Prix / Yoshi's Egg trackside banner from Mario Kart Wii. A Waluigi Grand Prix / Yoshi's Egg sign from Mario Kart Wii. A Waluigi Kart trackside banner from Mario Kart: Double Dash!! Waluigi Kart is a sponsor that appears in Mario Kart: Double Dash!! and Mario Kart Wii. Although it is ambiguous as to what the sponsor does, it is named after Waluigi. The logo consists of the word "Waluigi" in a black outline yellow font, and "Kart" in an all capitals version. A purple and black outline appears around both words, and all of the text and outline is covered in small lightbulbs. An image of Waluigi's face and shoulders appears on each side of the logo at a slight angle. It is advertised by means of signs. A Waluigi Kart sign from Mario Kart Wii. A Waluigi Oil trackside banner from Mario Kart: Double Dash!!. Waluigi Oil is a sponsor that appears in Mario Kart: Double Dash!! and Mario Kart Wii. Presumably, the company supplies oil for the Karts used on the games and is run by Waluigi. The logo consists of the company name written in a black font with the dots of the "I"s colored in red and the center of the "O" partly filled with purple and partially filled with white, to make it look like it contains oil. A 2D artwork of Waluigi's head inside a white circle with a black outline to the right of the text, and the whole logo has a purple background. It is advertised by means of trackside banners. A Waluigi Oil trackside banner from Mario Kart Wii. A Waluigi Sport trackside banner from Mario Kart DS. Waluigi Sport is a sponsor that appears in Mario Kart DS and Mario Kart 7. Presumably, it is some kind of sports company with some relation to Waluigi. The logo consists of the company name in an all-capitals blue and green gradient font with a with outline on a red background. Six stars arranged in three rows of two appear on either side of the logo, with the two stars on the middle rows being white and the other four being yellow. It is advertised by means of trackside banners. A Wario GP trackside banner from Mario Kart: Double Dash!!. Wario GP is a sponsor that appears in Mario Kart: Double Dash! !, Mario Kart DS, Mario Kart Wii and Mario Kart 7. Although exactly what the company does is ambiguous, GP presumably stands for Grand Prix and is run by Wario. The main logo consists of the company name in an all capitals white font with a black outline and a shape similar to Wario's moustache on either side of the text. The logo has various backgrounds, one of which is a zoomed in version of the word "Wario" in monochrome green. another version uses gray tessellated hexagons with pale gray outlines. The other logo is significantly different, using a dark blue background, but also changing the color of the moustache to white and using a yellow and orange gradient fill instead of the white. Another logo is introduced in Mario Kart Wii which uses the yellow and orange gradient but with the black moustache and a mainly gray background with a darker gray outline and a white diagonal stripe in the middle with a darker gray line on the right hand side. Wario GP banners are introduced in Mario Kart 7, which feature the original text vertically on green banners with yellow stipes on either side of the text. It is advertised by means of trackside banners and banners. A Wario GP trackside banner from Mario Kart DS. A Wario GP trackside banner from Mario Kart Wii. A Wario Kart trackside banner from Mario Kart: Double Dash!!. Wario Kart is a sponsor that appears in Mario Kart: Double Dash!! and Mario Kart Wii. Although it is ambiguous as to exactly what the company does, is appears to have some sort of relation to Wario. The logo consists of the name in a black outlined all capitals font with a yellow and orange gradient, with an extra blue and black outline around it all. The writing is covered in small spots that give the effect of lights, and a black outlined image of Wario giving a thumbs up appears on either side of the text. Another logo uses a green all capitals font with a white outline and 3D perspective effect. A small yellow star with a green outline appears between the two words, and the logo has a green background with a slightly paler green background. The other logo is a parody of the Nintendo-style Mario Kart logo, which is in turn based off of the Nintendo logo. The logo uses the same font and composition as the Nintendo logo, minus the registered trademark sign, and uses pale blue for the oval and font and darker blue for the background. It is advertised by means of signs and trackside banners. A Wario Kart trackside banner from Mario Kart Wii. A Wario Racing trackside banner from Mario Kart: Double Dash!!. Wario Racing is a sponsor that appears in Mario Kart: Double Dash! !, Mario Kart DS and Mario Kart Wii. Although what the company does is ambiguous, it appears to have some sort of relation to Wario. The logo consists of the company name written in a purple font with black outlines and a three dimensional effect, with black shapes on either side that resemble Wario's moustache. The background is pale green with a darker lightning bolt shape in the middle. The logo is slightly different in Mario Kart DS, using a red fill for the font, a white background and a pale green lightning bolt shape. It is advertised by means of trackside banners. A Wario Racing trackside banner from Mario Kart Wii. A Yoshi trackside banner from Mario Kart 7. Yoshi is a sponsor that appears in Mario Kart Wii and Mario Kart 7. The logo from Mario Kart Wii consists of the name in a black font with a green outline, excluding the "O", which instead is white. The background is also white and a blue square with rounded corners appears on the right, which contains a green Yoshi Egg with five spots and a gold outline. In Mario Kart 7 the logo remains mostly unchanged, except the egg in the square is now at an angle, has only three spots and a black outline. It is advertised by means of trackside banners. A Yoshi trackside banner from Mario Kart Wii. A Yoshi's Egg trackside banner from Mario Kart: Double Dash!!. Yoshi's Egg (also called New Yoshi's Egg) is a sponsor that appears in Mario Kart: Double Dash! !, Mario Kart DS and Mario Kart Wii. Presumably, it is a new type of Yoshi Egg for sale and is run by Yoshi. The logo consists of a red oval containing the word "New" in a white all capital font on the right on a white background. "Yoshi's Egg" is written in a font similar to that of the Yoshi's Island series, with "Yoshi's" in black and "Egg" in white with a blue outline around both, as well as some extra curves. A different trackside banner that the sponsor shared with Waluigi Grand Prix was introduced in Mario Kart Wii, which featured a black Waluigi Grand Prix logo at the bottom and "Yoshi's Egg" in the normal font but with a green outline and without the oval reading "New". The background is yellow and features a pale yellow Yoshi Egg silhouette in the middle that matches the border. Yoshi's Egg also shares a sign with Waluigi Grand Prix in Mario Kart Wii, with part of the Waluigi Grand Prix logo in a dark blue stripe at the bottom and Yoshi's Egg's green outlined logo above it. The letter "Y" in a dark green gold outlined logo appears at the top of the sign. The sign is shaped like a Yoshi Egg, being a white oval with five green spots and a gold outline. It is advertised by means of trackside banners and signs. A Yoshi's Egg / Waluigi Grand Prix trackside banner from Mario Kart DS. A Yoshi's Egg / Waluigi Grand Prix trackside banner from Mario Kart Wii. A Yoshi's Egg / Waluigi Grand Prix sign from Mario Kart Wii. A Yoshi Kart trackside banner from Mario Kart Wii. Yoshi Kart is a sponsor that appears in Mario Kart DS and Mario Kart Wii. This sponsor appeared in two stages, Delfino Square and N64 Choco Mountain. The first variant from Delfino Square has the company name written in orange and a shadow effect. The center of the "O" in "Yoshi" is filled in with yellow. The background is dark blue with a white diagonal stripe on the left. The second variant only appears on one billboard of Choco Mountain; its design is more simplistic, with a white background, "Yoshi" in blue text and "Kart" in black text. Similarly, a diagonal line strikes through the "o" of "Yoshi", except it is red and thinner. This logo also appears in Mario Kart Wii, which features Delfino Square as a Retro Course. While the logo has the same layout, it was slightly refined, with a more curved font, a black outline and 3D effect and an orange and yellow gradient rather than a solid fill. It is still advertised by trackside banners. A Yoshi Kart trackside banner from Mario Kart DS. A Yoshi Kart billboard from Mario Kart DS. This page was last edited on April 22, 2019, at 03:50.